May his Kingship be established in your lifetime and in your days, and in the lifetime of the entire household of Israel, swiftly and in the near future - Amen. May his great name be blessed, forever and ever. Blessed, praised, glorified, exalted, extolled, honored elevated and lauded be the Name of the holy one. Blessed is he above and beyond any blessings and hymns. Praises and consolations which are uttered in the world – Amen. 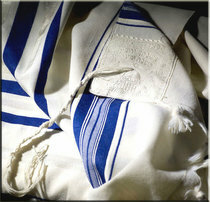 May there be abundant peace from Heaven, and life, upon us and upon all Israel - Amen. He who makes peace in his high holy places, may he bring peace upon us, and upon all Israel - Amen. Y'hei sh'mei raba m'varakh l'alam, u-l'almei almaya. birkhata v'shirata, tushb'hata, v'nehemata da'amiran b'alma v'imru, amen. Y'hei sh'lama raba min sh'maya, v'hayim aleinu v'al kol yisrael, v'imru, amen. Oseh shalom bi-m'romav, hu ya'aseh shalom aleinu v'al kol yisrael, v'imru, amen. O God, behold and see the sorrow of my heart. Willowed and bereft I mourn the loss of the dear companion of my life. Help me, O God, to bear this burden bravely. Teach me to bend my will to Thy supreme will that all things for the best, for all Thy ways are right and all Thy judgments just. Thou didst send me untold blessings through the gift of his loving care. For these my heart overflows with thankfulness. May I not mar the gratitude I here offer by murmuring and complaints. Grant that I may live true to the hope and prayers which bound our hearts together. Fill me with zeal to carry out every noble thought he cherished and to fulfill every duty to my home and my dear ones which he bequeathed to me. May the memory of his love and faithfulness ever aid and inspire me. I cast my burden upon Thee, O Lord; uphold me in the hours of my weakness, for Thou art near to the broken and contrite heart. May my life prove that love is as strong as death. Grant me one more and more of the comforting faith in life immortal. May Thy blessing of peace attend me through all my days - Amen. My heart cries unto Thee, Almighty God, out of the depths of my distress. Thou alone knowest the loneliness of my days, bereft of whom Thou gavest me as my companion my helpmate. Let me not yield to despair! Help me be loyal to every trust she reposed in me, steadfast to every duty her passing away has left to me. Fill me with manly courage to live true to the ideas of purity and nobility with which she inspired me. Grant unto me strength and unto our dear ones the steadfast resolve to cherish faithfully the spirit of love with which she filled our home. May the example of her goodness live on as an impulse to every good endeavor. May the bonds of our common sorrow unite more firmly the ties of our family affections. Teach me, O God, the lesson of resignation. Fill me with the firm trust that death does not end all, but that in death, as in life, all are in Thy keeping. May I say with sincere humility: Thy thoughts are not our thoughts; nor are Thy ways our ways. For high as are the heavens above the earth, so high are Thy ways above our ways, and Thy thoughts are above our thoughts - Amen. In this silent grave repose the earthly remains of my best friend, my dearest benefactor appointed by God Himself to love and protect me during the tender years of my life, my dear and beloved father. Oh, to hear thy voice again, to clasp thy hand and look into thy fatherly eyes for comfort! How can I repay thee for all the devotion and loving kindness which I have received at your hands. O Lord, show me the way and give me the will to live and to work so that I may reflect honor upon my dear father’s memory. Thus will also glorify Thy name, for Thou are the father of the fatherless, and in thy keeping are the souls of all our dear ones - Amen. O mother dear, I cannot think of thee as dead, though I stand before thine earthy grave, thy spirit livest and thy love is everlasting. Yea a mother’s love is eternal, even as God is eternal who implanted that love in her heart! O mother dear, how can I begin now to thank thee or to repay thee for all that thou hast suffered and endured in order to give me life and to shelter, protect and rear me until I had reached the age of discretion and independence. And even unto the last thou hast been my loving guide and my ever present inspiration. And now, O sacred spirit of my mother, I can offer thee only the tender tear of loving and devoted memory. O God, help me to live a life of worthy of my mother’s hope and prayer. Preserve her soul in Thine all-loving peace, and may her spirit ever keep me pure and clean so that when my time comes to leave this earthly dwelling, I may be found worthy to join my mother in her eternal abode of bliss in which the noble and the pure in spirit may behold Thy countenance in everlasting joy -Amen. Tender memories fill my thoughts as I stand here by the grave of my brother. Precious was the blessing that God gave me in his life. A brother indeed, was he at all times, kind and considerate in his words, thoughtful and generous in his deeds. O God, in Thine infinite wisdom and justice Thou has taken him from me. I sorely miss him. But the influence of his character is and ever shall be upon me. I pray Thee, O God, to strengthen my soul with abiding faith in life hereafter; and give me courage to bear whatever Thy providence sends unto me. According to my power, may I never fail to aid others who are in need of sympathy and help – Amen. How precious to me was the deep love of my sister! And now, O God, that Thou has taken her from me there is a void which I often feel can never be filled. Her kindness, her patience, her comforting words softened the trails of many a day. As I think of all this, how heavily is my heart bowed down by the sorrow of her taking away. As I stand in the peaceful quiet of this spot, divine hope whispers in my soul that she is at rest in Thy keeping. May this thought sustain me. May I be thankful unto Thee, O God, for the life of my dear sister; and may every thought of her incline my soul to deeds of kindness, mercy and righteousness - Amen. O God, from the depths I cry unto Thee. Thou has taken away from me my dear child. O help me to feel that the ways of Thy providence are wise and good, though we understand them not. Thou, O God, knowest that my soul would not question Thy justice; I would not rebel against Thy decree. It is the tender and deep love which my dear child brought into my heart that draws me hither. O merciful Father, have mercy upon me and send the healing balm of Thy consolation in my grieving spirit. In this moment my soul feels, but little strength to praise. Yet if Thou didst take away this life, Thou also didst give it. O may the light of love which my child kindled within my heart continue to burn brightly, so that as I regain strength of soul, I may bring cheer unto all my dear ones. Praised by Thou, O God, who comfortest the mourner with hope in life eternal - Amen. May God remember the soul of my honoured father (name) who has gone to his repose; for that, I now solemnly offer charity for his sake; in reward of this, may his soul enjoy eternal life, with the souls of Abraham, Isaac and Jacob; Sarah, Rebecca, Rachel, and Leah, and the rest of the righteous males and females that are in Paradise, and let us say - Amen. May God remember the soul of my honoured mother (name) who has gone to her repose; for that, I now solemnly offer charity for her sake; in reward of this, may her soul enjoy eternal life, with the souls of Abraham, Isaac and Jacob; Sarah, Rebecca, Rachel, and Leah, and the rest of the righteous males and females that are in Paradise, and let us say - Amen. May God remember the soul of my dear departed family who have gone to their repose; for that, I now solemnly offer charity for their sake; in reward of this, may their souls enjoy eternal life, with the souls of Abraham, Isaac and Jacob; Sarah, Rebecca, Rachel, and Leah, and the rest of the righteous males and females that are in Paradise, and let us say - Amen. The Lord is my shepherd; I shall not want. He maketh me to lie down in green pastures. He leadeth besides the still waters. He restoreth my soul; He guideth me in straight paths for his namesake. Yea, though I walk through the valley of the shadow of death, I will fear no evil, for Thou art with me. Thy rod and Thy staff, they comfort me. Thou preparest a table before me in the presence of mine enemies. Thou hast anointed my head with oil; my cup runneth over. Surely goodness and mercy shall follow me all the days of my life; And I dwell in the house of the Lord forever. I will lift up mine eyes unto the mountains; Whence will come my help? My help cometh from the Lord. Who made heaven and earth. He will not allow your foot to falter; He that keepeth thee will not slumber. Behold, He that keepeth Israel doth neither slumber nor sleep. The Lord is thy keeper; The Lord is thy shade upon thy right hand. The sun shall not smite thee by day, nor the moon by night. The Lord shall keep thee from all evil; He shall keep thy soul. The Lord shall guard thy going out and thy coming in. From this time forth and forever. O God, full of mercy, Who dwells on high, grant proper rest on the wings of the Divine Presence. In the lofty levels of the holy and the pure ones, who shine like the glow of the firmament - For the soul of (…….) who has gone on to his world, because, without making a vow, I will contribute to charity in remembrance of his soul. May his resting place be in the Garden of Eden - Therefore may the Master of Mercy shelter him in the shelter of His wings for Eternity, and may He bind his soul in the Bond of Life. The Lord is his heritage, and may he repose in peace on his resting place - Amen.